Garden tools are implements used for tending to plants. 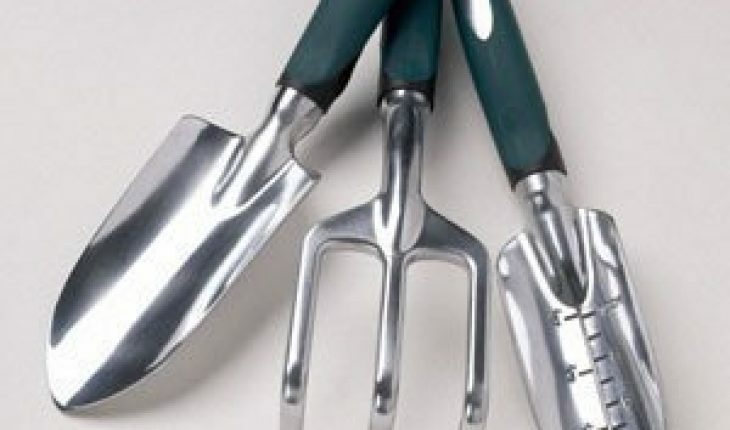 Garden tools often intersect with the range of equipment used in agriculture and horticulture. Garden tools are either hand tools (tools used with manual exertion or force) or power tools (tools driven by motors or engines). 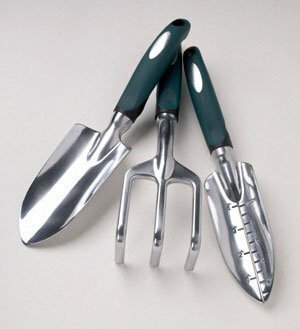 Many hand tools used by gardeners today have their origins in the earliest farming implements, such as the garden fork, hoe, pitchfork, plough, and spade. These are now available in various types of sophisticated materials such as aluminum and carbon steel, as compared to their predecessors’ materials: bone, flint, and wood. The evolution of metalworking started with copper, and subsequently iron and steel. This process allowed for the manufacturing of more resilient tools. Industrial metalwork gave rise to cutting tools such as grass shears and pruning shears. The lawn mower was the first gardening power tool. A range of power tools with diverse uses followed it: cultivators, hedge trimmers, irrigation sprinklers, lawn aerators, leaf blowers, leaf sweepers, and even mini-tractors. * Remove soil from digging tools after use. Use a hose, or for stubborn debris, a screwdriver. * Dry the tools before putting them away, to prevent rust. Occasionally apply linseed oil into wooden tool handles to prevent decay. * Wipe metal parts of loppers, pruners, and shears with an oily rag after each use. A clean rag and light spray of penetrating oil may also be used. * Regularly sharpen cutting tools as well as the edges of shovels and spades. Use a whetstone for cutting tools and a file for digging implements. * Clean any tools exposed to chemical applications. Fertilizers and pesticides may corrode metal parts.